Availability of Call Letters on DMRC website for CBT Will be intimated by email/sms on registered email/phone number Delhi Metro Rail Corporation (DMRC), a joint venture company with equity participation from Govt. of India and Govt. of National Capital Territory of Delhi has been entrusted with the responsibility of implementation of the rail based Mass Rapid Transit System for Delhi, NCR & other metros. For Non- Executive posts, viz. under SECTION ‘B’ & ‘D’ (for post codes RNE01 to RNE09 & CNE01 to CNE05), the selection methodology will comprise a two-stage process – CBT (two papers), followed by Medical Examination in prescribed medical standard & for Maintainers posts under, viz., RNE10 to RNE13, the selection methodology will comprise a two-stage process – CBT (One paper), followed by Medical Examination in prescribed medical standard. The selection process would judge different facets of knowledge, skills, comprehension, aptitude and physical fitness. Candidates will have to pass through each stage successfully (including Medical examination), before being adjudged as suitable for selection. multiple-choice objective type questions, bilingual (Hindi/English), on General Awareness, General Intelligence & Reasoning, Quantitative Aptitude (General English for Maintainer-Electrician, Electronic Mechanic, Fitter and Ref & AC Mechanic) and/ knowledge of the discipline/trade. There will be a total of 120 questions, each carrying equal marks. There will be negative marking. For every wrong answer 1/3 marks will be deducted. The Paper-I shall be of 1.5 hours duration. Paper-II (Not for Maintainers post, viz., from RNE10 to RNE13) will consist of objective type questions on General English to judge the knowledge of English language. There will be a total of 60 questions, each carrying equal marks. There will be negative marking. For every wrong answer 1/3 marks will be deducted. The Paper-II shall be of 45 minutes’ duration. Candidates who qualify separately in Paper-I & Paper-II and rank high on the merit list within the zone of consideration in (Both Paper-I & Paper-II separately) as decided by DMRC shall be called, based on the overall merit of CBT(both Paper-I & Paper-II together), category wise, for Medical Examination/GD & Interview, at Delhi/NCR. Medical Examination: All candidates shall have to undergo the medical fitness test(s) and meet the medical standards prescribed by DMRC for various posts. Expenses for the first time medical examination of the candidate will be borne by DMRC. However, in case a candidate seeks extension for joining or re-examination, subject to extant rules, then for the second time medical examination/ re-examination, if need so arises, the expenditure for the medical test/s will be borne by the candidate himself/herself. The success in the examination does not confer any right to appointment unless the corporation is satisfied after such an inquiry, as may be considered necessary, that the candidate having regard to his/her character and antecedents is suitable in all respects for appointment to the service. The selected candidates (both Regular & Contract), will undergo intensive training for prescribed duration before posting on the job. The Corporation has the right to enhance or reduce the training period at its discretion for any or all the trainees. The selected candidates (on regular posts) on appointment will be on Probation for a period of two years (including period of training). During the probation period, candidates shall be required to pass various examinations. The service of the candidate during probation period can be terminated by the corporation if the performance of candidate is found to be unsatisfactory, in accordance with the terms & conditions of offer of appointment & receipt of satisfactory police report. posts of Office Assistant & Store Assistant, as applicable from time to time and other benefits which include Perks, HRA or lease, perks as applicable to TOs, Medical benefit, EPF, Gratuity, and Insurance etc. as per extant rules of the Corporation as applicable to Direct Recruit employees from time to time. However, candidates for the post of Office Assistant & Store Assistant, will be paid a lump sum salary of Rs.45,000/- per month. Candidates are required to apply online through website www.delhimetrorail.com only. No other means/mode of application will be accepted and there shall be no need to submit any hard copies of the uploaded documents. Candidates are required to have a valid personal e-mail ID and valid mobile number. It should be kept active during the currency of this recruitment process. In case a candidate does not have a valid personal e-mail ID, he/she should create his/her new e-mail ID before applying online. Under no circumstances, he/she should share/mention e-mail ID to/of any other person. Candidates are first required to go to the DMRC’s website www.delhimetrorail.com and click on the link “Career”. Thereafter, he/she may open the recruitment notification titled “<Title No.>”. He/she should thoroughly go through the vacancy notification first to let him/her know the eligibility, age criteria etc. On Successful Completion of registration an application sequence No. and password will be generated. (User id & password received on your e-mail and mobile number). Category/Caste certificate (OBC/SC/ST/PWD) -maximum 1 MB size, in JPG/JPEG format. Date of birth proof document as per guidelines (Maximum 1 MB size, in JPG/JPEG format). Qualifying marks certificate/Last Semester marks sheet (maximum 1 MB size, in JPG/JPEG format). Credit/Debit Card/Net banking for transaction of exam fee, as only online payment is applicable. Applicant must read declaration and preview application form before submission, also they can take a print out of the application form. Applicant will be redirected to payment gateway post submission of application form. After successful transaction a payment acknowledgment slip (with unique application sequence number, transaction ID, applicant name, category, exam fee and post applied form) will be generated and should be downloaded for any future communication regarding application form. Until the payment is made, the candidate will not be registered for the test. While applying for these posts, the applicant should ensure that he/she fulfils the eligibility and other norms mentioned above on the specified dates and that the particulars furnished by him/her are correct in all respects. In case, it is detected at any stage of recruitment that a candidate does not fulfill the eligibility norms/criteria and /or that he/she has furnished any incorrect/false information or has suppressed any material fact(s), his/her candidature will stand cancelled. If any of these shortcomings is/are detected even after appointment, his/her services are liable to be terminated. The validity of the Selection Panel is for two years from the date of its approval. The selection of candidate by DMRC does not confer any right to the candidate for appointment. Candidates employed in Govt.Dept. /PSU/ Autonomous Body must produce ‘NOC’ from the present employer on the date of GD & Interview/Medical Examination. www.delhimetrorail.com). No other format will be acceptable. Candidates should keep sufficient numbers of same Photographs in reserve for future use, which they are using in the application form. Request for change of mailing address / e-mail address & Mobile Number will not be entertained under any circumstances. Court of jurisdiction for any dispute will be at Delhi only. DMRC reserves the right to fix the minimum standard/qualifying marks for each component of selection for any/all posts. 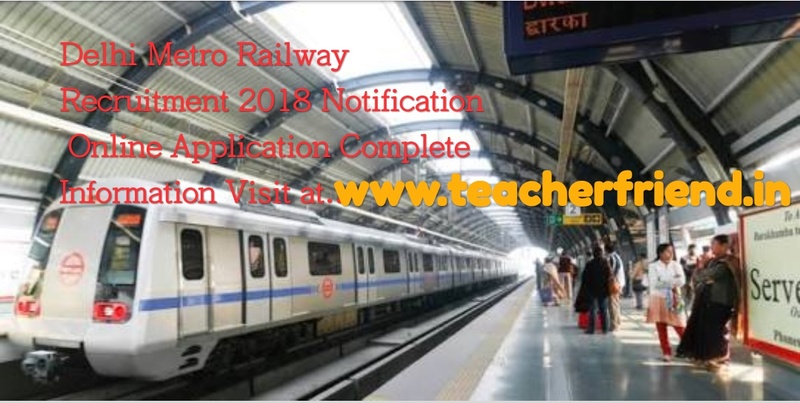 Candidates must remain in constant touch with DMRC’s website www.delhimetrorail.com for information regarding dates of CBT, result of CBT, schedule of Interview / GD/Standards of Vision for Medical test etc. The eligible candidates, whose applications are available on the Master list, may download the admit card through DMRC’s website www.delhimetrorail.com only, as per schedule & instructions notified on DMRC’s website in advance. The admit card for CBT will also be sent on the registered email of the candidate. It can also be downloaded from DMRC website www.delhimetrorail.com only. DMRC will not be responsible for any information issued/posted on any other website than DMRC’s, viz., www.delhimetrorail.com. The issue of Admit Card to appear in the CBT/Interview/GD/Medical fitness test or the fact of having passed these tests or having been placed on the final merit list, would not be a proof of candidate’s eligibility. The candidature will be purely provisional subject to eligibility and other verification, before, or, after appointment in DMRC. The onus of ensuring that the candidate meets all the eligibility requirements will rest on the candidate himself/herself, all through the recruitment process. Candidates will be allowed to appear in the CBT/Interview/GD/ Medical fitness test will be purely on provisional basis and no candidate has a right to appointment or any compensation, only on the ground of having appeared in, or, having passed the written or any other screening test. DMRC is not responsible for any printing error that might have inadvertently crept in. Bringing mobile phone/ Communication device in the examination Hall will be deemed GUILTY OF MISCONDUCT & suitable actions including immediate expulsion of candidate from the examination hall will be taken.